Saudi Arabia’s deserts have been covered in a blanket of snow as temperatures plummeted across parts of the Middle East. 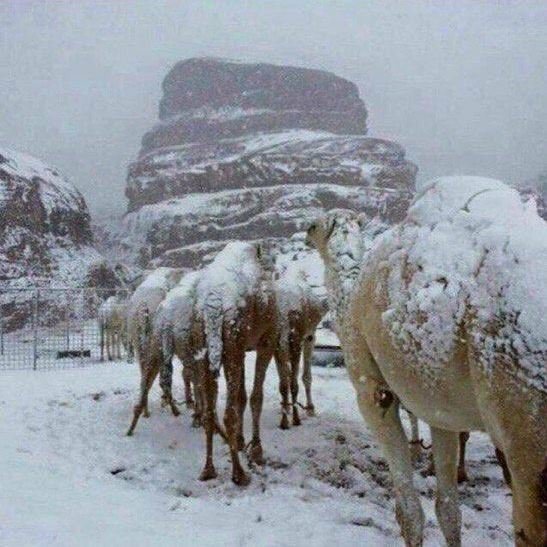 Bizarre photos show camels covered in snow and locals – who normally face blistering temperatures – picking up and throwing the snow. Others shared their excitement at the conditions on social media, or posted videos of their vehicles skidding around on the frost. A huge amount of Saudis flocked to the Tabuk region in the north of the kingdom, where the high altitude meant thicker, heavier snowfall was found. Locals have made the most of the rare snowfall. The kingdom is famous for its blistering heat and deserts covered in sand. But while many people enjoyed catching a glimpse of the snow, the conditions have also had tragic consequences. Nine Syrian refugees attempting to cross the border into Lebanon froze to death, the Lebanese Army said. 0 Response to "Camels and deserts covered in snow as storm hits Saudi Arabia "